Need bilingual contacts for a move to France? Here’s our A-Team! Home > Blog > Moving to France? Here’s our A-Team of bilingual contacts! Moving to France? Here’s our A-Team of bilingual contacts! After holidays, the most common reason our clients hire a campervan is to carry out a recce before moving to France. Whether buying a house, starting a business or searching for a Dutch barge to live aboard, hiring a motorhome provides a great combination of transport, accommodation and office space for an exploratory trip. If you are planning to move here to live, enjoy an extended tour or run a business, one of the biggest challenges you will face is interaction with the French administration system (yes, it really is every bit as bad as everyone says it is). Even if you speak good French, understanding legal and tax matters is a minefield and the type of complex French used in official correspondence (full of double negatives with every sentence five times longer than necessary!) is impossible for the layman to understand. We started our first business in France 18 years ago, and the first few years were made very difficult thanks to our lack of understanding of how things work here, some bad accountancy advice and our poor language skills. Life here took a turn for the better once we established some excellent contacts. So, to ease your transition in to a life in France, we’re sharing our bilingual “A” team of contacts with you so you can benefit from their experience. Translations: Aurore Vuillet at World Connection has been translating documents between French and English for us for the last four years. We rely on her to ensure we get our important correspondence right. From translating whole marketing websites from English into French to helping with us with a letter to our next-door neighbour about his barking dogs (! ), Aurore has delivered perfect translations and always consults if anything is remotely ambiguous to make sure she gets it right. 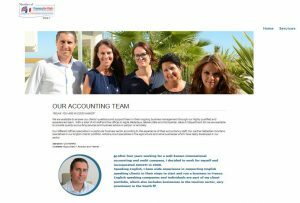 Accountant: Sebastien Giordano (who speaks excellent English) and his team at Augefi are simply the best accountancy firm we have ever worked with. They advise on all matters relating to our business, from tax to payroll issues, and also provide invaluable advice on personal tax matters. Moving to France is the best lifestyle choice we have ever made so if you’re thinking about it we would encourage you to GO FOR IT! And be sure to use our bilingual “A” team of contacts if you need some help. In the meantime, plan your own recce in one our motorhomes so you can try France on for size before you take the plunge. If you found this blog helpful, please share it with your friends on Facebook. ← Spring… and it’s carnival season all over France!